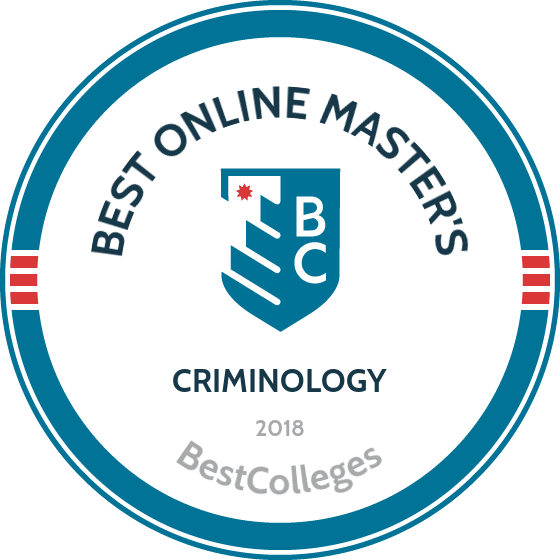 WHAT ARE THE BEST ONLINE MASTER'S IN CRIMINOLOGY PROGRAMS? What Else Can I Expect From an Online Master's in Criminology Program? From courtroom dramas to murder mysteries, crime has always captivated the American public. Criminologists take this fascination a step further, seeking to understand crime through the study of human behavior. By earning an online master's degree in criminology, you can help pinpoint the causes and consequences of crime from a number of legal, ethical, and social science perspectives. Criminologists are a kind of sociologist who use statistics and other methodologies to help manage and prevent crime. While demand for sociologists will remain steady over the next several years, the need for statisticians will increase by 34% between 2014 and 2024, according to the U.S. Bureau of Labor Statistics. This will add 30,000 jobs to the field, which each pay around $80,500 annually. WHAT'S THE DIFFERENCE BETWEEN A CRIMINAL JUSTICE AND CRIMINOLOGY DEGREE? Many prospective students want to understand the difference between criminology and criminal justice. While the two fields are interrelated, criminal justice is much more concerned with how crime is punished and deterred through a system of law enforcement, criminal courts, and criminal corrections. By contrast, criminology is a research discipline, using qualitative and statistical methods to identify the root causes of crime. Online criminology master's programs provide students with a multidisciplinary understanding of not only why crime happens, but how it can be prevented. Borrowing from fields like sociology, psychology, philosophy, and legal theory, criminology is a broad-based study of criminal behavior that influences the administration of justice. This program examines crime from the perspectives of both criminals and victims. Professionals seek to deter crime through the pursuit of justice. Graduates are prepared to practically apply criminal justice theories within law enforcement. Courses may include intelligence and homeland security, violence against women, and juvenile justice. This program combines research and analysis to interpret current trends in criminal behavior. By understanding how crime changes over time, and which variables influence criminal behavior, this degree equips students with tools to influence criminal law, policy, and enforcement. Typical courses for this degree include crime prediction and prevention, computer forensics, and human behavior. Combining core credits with varied electives, FSU’s master’s in criminology is a comprehensive, well-rounded program. Of the 36 required credits, 15 are core courses such as computer applications and research methods in criminology. The remaining credits comprise electives within the College of Criminology and approved credits from other disciplines. The program is offered fully online, and professors are available to offer individual guidance and assistance. Applicants should have a bachelor’s degree from an accredited institution and must submit transcripts and a valid GRE score, along with a personal statement and a resume. Florida residents receive discounted tuition, but all students may qualify for financial aid. UT Dallas offers one of the strongest online criminology master's programs in the country. The 36-credit master of science in criminology is offered fully online. Students complete 15 core credits and 15 elective credits, along with six credits of non-criminology electives or independent research. Students who take four courses per semester may complete the degree in one year. Applications are accepted on a rolling basis, but applicants who wish to enroll in the fall should submit their materials by July 1. Applicants should have a bachelor’s degree from an accredited institution, a 3.2 GPA, and a GRE score of at least 300. Applicants must submit a personal essay and three letters of recommendation. Texas residents receive discounted tuition. Students completing UCI’s criminology master's program online take 52 units of coursework over two years. The master of advanced study in criminology, law, and society comprises 13 courses, the last of which serves as a capstone and requires a research paper. Although the program is offered online, distance learners must attend one five-day, on-campus residency in Irvine, California before their first semester. Applicants should submit undergraduate and graduate transcripts and should have a bachelor’s degree and a minimum 3.0 GPA. Applicants must also submit three letters of recommendation and two personal statements, one of which is in lieu of submitting pre-graduate examination scores. In-state and out-of-state students pay the same tuition rate. Texas A&M offers one of the most flexible online criminology master's programs. Its master of science in applied criminology can be completed entirely online in as few as 18 months. Courses last only five weeks, with students taking one class at a time, and there is no thesis requirement. The program offers rolling admissions deadlines and enrollment dates throughout the year. Applicants should have a bachelor’s degree and a 3.0 GPA for their last 60 credits of coursework. Applicants with GPAs below 3.0 must submit GRE scores, and all applicants must submit a letter of reference. Texas residents receive discounted tuition. MSU offers a master of science in criminology and criminal justice as a 30-credit thesis program or 36-credit non-thesis program. Students enrolled in the thesis track take 21 core credits and nine elective credits. The non-thesis track requires 15 core credits and 18 elective credits. Both tracks allow students to choose non-criminology-related electives. Non-thesis students complete a policy paper as a capstone project. Students may enroll three times per year, in the fall, spring, and summer. Applicants should have a bachelor’s degree in criminal justice, criminology, or a related field, and a 3.0 GPA. All online students pay the same tuition rate, regardless of residency. RU’s MS in criminology is unique among online criminology master’s programs; students may pursue specialized areas of focus, such as leadership, human behavior, or cybercrime/terrorism. Moreover, students may study issues related to human trafficking, public safety, or victim advocacy in each class they take. During the required 36 credits, students ask their professors to emphasize topics relevant to their career goals. Applicants should have a bachelor’s degree and must submit all transcripts, a resume, two letters of recommendation, and two writing samples. They must also complete a faculty interview. Online students pay the same tuition rate regardless of residency, but veterans and active military members receive discounted tuition. SJSU’s MS in criminology with a concentration in global criminology emphasizes the study of modern international crime, which distinguishes it from other criminology master's programs online. Students explore innovative research methods to understand and evaluate responses to crime around the world. The curriculum comprises 15 units of core courses, 12 units of concentration courses, and an applied project. Two non-departmental classes may be taken as electives if students can demonstrate the classes’ relevance to their career goals. Applicants should have a bachelor’s degree and a GPA of 3.0 or higher for the last 60 credits of their studies. Pre-graduate examination scores are not required. California residents receive discounted tuition. ISU offers two criminology master's programs online: the master of arts and the master of science in criminology and criminal justice. The MA requires 33 credits, while the MS requires 36 credits. The MA focuses on research and culminates in a thesis, whereas the MS prepares graduates for professional practice in the criminal justice field. Applicants should have a bachelor’s degree and either a cumulative GPA of 2.75 or a GPA of 3.0 for the last 60 credits of study. Undergraduate prerequisites include dynamics of criminal and delinquent behavior, juvenile delinquency, and sociology, psychology, and political science. GRE scores are not required. Cal U in California, Pennsylvania, offers a cohort-based MA in social science applied criminology. Students completing the criminology master's program online follow a 30-credit, 12-course sequence that guides students through advanced criminology analytics, behavioral examination, and research methods. Cohorts begin twice a year, in the fall and spring. Students complete an internship and a thesis. Cal U faculty have multidisciplinary backgrounds, so students receive a comprehensive education. Applicants should have a bachelor’s degree and a cumulative GPA of 3.0. Those with lower GPAs may submit a resume and personal statement to be granted conditional admission. While there is no prerequisite undergraduate major, degrees in criminology, criminal justice, forensic science, psychology, or sociology are preferred. WKU’s online master's degree in criminology is ideal for students with busy schedules. Because the master of arts in criminology program is taught asynchronously, students may begin their studies at any time. The 30 required credits include 15 credits of core courses and 15 credits of electives. Students may take up to three electives outside the major. Applicants should have a bachelor’s degree from an accredited institution, a GRE analytical writing score of 3.5, and GAP scores of 600 or 2200. Transfer students may bring up to 12 credits from another graduate institution. In-state and out-of-state students pay the same tuition rate. Online criminology master's programs provide students with the interdisciplinary knowledge necessary to launch or advance careers in criminology. However, the specific courses students take vary by school and the degree program selected. The following is a sampling of courses that are typically available to students earning a master of criminology online degree. Crime prediction and prevention: This course reviews the variety of theories and methods employed by police and communities to identify and prevent criminal threats. Students will also analyze the history and future of crime prevention, along with the use of intelligence, technology, and comparative statistics in law enforcement and other crime-related fields. Cyber criminology: This course covers cyber crimes, including hacking, terrorism, fraud, and embezzlement. Students will learn about cybercrime tactics and the psychology that drives a cybercriminal to act. This course is beneficial to those pursuing careers as forensic scientists or intelligence analysts. Applied statistics in criminology: Students will learn about statistical techniques used to study and prevent crime, which includes knowledge of quantitative and qualitative methods. Those planning careers as statisticians will benefit from this course, but it is also helpful to all criminology students as a basis for researching and predicting criminal behavior. Ethical issues in criminology: This course focuses on the ethical standards used in the collection and presentation of criminal research and statistics. It may also emphasize ethical dilemmas confronting criminology researchers, including issues of confidentiality and consent. This course is especially useful for those pursuing positions as researchers, sociologists, and statisticians. HOW LONG DOES IT TAKE TO GET AN ONLINE MASTER'S IN CRIMINOLOGY? Online master's programs in criminology consist of both general education and elective courses that normally total between 33 to 36 credit hours. The curriculum may also include a final capstone course that is more hands-on than a traditional class project. If taken full-time, the degree can usually be completed in one year. However, many students are working professionals and may choose to complete a program part-time, lengthening the time it takes to earn the degree. Total completion time also depends on whether students are taking courses as a cohort or in a format that is individually paced. Some programs use a cohort learning model in which students take classes as a group at a scheduled time. This allows for more peer and instructor interactions, but also slows the time it takes to complete a degree. Another factor that impacts the duration of online master's programs in criminology are transfer credits. Distance learners can graduate quickly if they have previously taken other courses that meet degree requirements. When researching options for online master's programs in criminology, it's important to review a school's accreditation. The accreditation process is rigorous, and when granted, confirms that the online college has met academic quality standards. Earning a degree from an accredited institution ensures your time and money have gone toward a reputable criminology program. Accreditation for online education institutions can be granted by regional or national accrediting agencies. Regional accrediting standards are typically regarded as more stringent than those of national accrediting bodies. National accreditation is usually conferred upon online institutions that have a specific vocation or professional track. Certain programs, such as engineering or education degrees, may have their own special accrediting bodies. The U.S. Department of Education (ED) is a federal agency that offers financial aid, advocates for quality and accessible education, and promotes educational standards and policies. The Council for Higher Education Accreditation (CHEA) is a group of 3,000 colleges and universities that approves 60 accrediting organizations that are regional or career-based. It works as a partner organization to the ED to provide confidence in accrediting bodies. To assist in your research, review all accredited colleges and universities on the CHEA website. Through the observation of people and groups, sociologists collect data and conduct research to enhance our understanding of human behavior, society, and culture. Quantitative and qualitative research methods are typically used. In criminology, sociologists can explain why crimes occur and how they can be be prevented. By designing data collection techniques, such as surveys and polls, statisticians obtain information that helps identify and explain trends. Statisticians provide compelling evidence that criminologists use to influence law and policy. These professionals must be proficient in the use of statistical software that assists in data collection and analysis. These technicians work at crime scenes collecting evidence or in laboratories to assist in criminal investigations. Laboratory-based technicians analyze biological and digital evidence to reconstruct crimes. This information is then synthesized to form a clear picture of how and why crimes occurred. Master's of criminology graduates may opt to pursue careers as criminology professors at institutions of higher education. A master's degree is typically sufficient for teaching criminology at community colleges. A career in postsecondary education provides the opportunity to conduct research and write articles to advance findings in the criminology field. Intelligence analysts, FBI agents, and police administrators can all benefit from a master's in criminology. Criminology programs help students understand the criminal mind and helps inform crime prevention strategies and techniques. A master's degree may also assist in career advancement and finding new opportunities with state and federal agencies. Careers available to graduates of online criminology master's programs vary, but those new to the field may benefit from high entry-level salaries. Salaries for criminology-related positions also increase according to experience. Criminology can be particularly lucrative for data-savvy statisticians and forensic computer analysts, while salaries for more standard law enforcement positions tend to hover around the national average. There are several ways to finance your master's degree in criminology online program. If you are currently working in a criminology-related field, find out if your employer offers tuition reimbursement. Other sources of funding include public and private scholarships and state-sponsored grants. Private loans are also available for educational purposes. You should also remember to complete the Federal Application for Student Aid (FAFSA). This makes you eligible for federal financial aid, which is available in the forms of low-interest loans, grants, and work study opportunities.